Wrinkly fingers make your grip less slippery. MIKE URWIN/NEWCASTLE UNIV. Scientists think that they have the answer to why the skin on human fingers and toes shrivels up like an old prune when we soak in the bath. 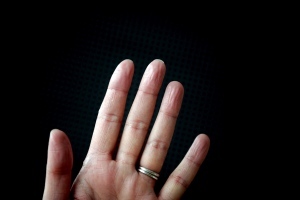 Laboratory tests confirmed a theory that wrinkly fingers improve our grip on wet or submerged objects, working to channel away the water like the rain treads in car tyres. In 2011, Mark Changizi, an evolutionary neurobiologist at 2AI Labs in Boise, Idaho, and his colleagues, suggested1 that wrinkling, being an active process, must have an evolutionary function. The team also showed that the pattern of wrinkling appeared to be optimized for providing a drainage network that improved grip. But until now, there was no proof that wrinkly fingers did in fact offer an advantage. In the latest study, participants picked up wet or dry objects including marbles of different sizes with normal hands or with fingers wrinkled after soaking in warm water for 30 minutes. The subjects were faster at picking up wet marbles with wrinkled fingers than with dry ones, but wrinkles made no difference for moving dry objects. The results are published today in Biology Letters2. "We have shown that wrinkled fingers give a better grip in wet conditions — it could be working like treads on your car tyres, which allow more of the tyre to be in contact with the road and gives you a better grip," says Tom Smulders, an evolutionary biologist at Newcastle University, UK, and a co-author of the paper. Changizi, M., Weber, R., Kotecha, R. & Palazzo, J. Brain Behav. Evol. 77, 286–290 (2011). Kareklas, K., Nettle, D. & Smulders, T. V. Biol. Lett. http://dx.doi.org/10.1098/rsbl.2012.0999(2013).